Welcome to 4 Seasons Shelters, a premiere builder of portable structures. We build them stronger to last longer. As horse owners we use our products and understand the need for comfort of your animals, always keeping safety in mind. 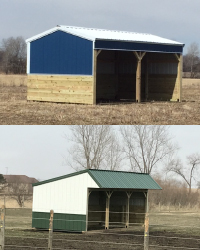 Here at 4-Seasons Shelters you have the freedom to customize and create an attractive maintenance free shelter that works best for you. Customization also means that you will have a shelter that will compliment your property nicely. As an added plus, in most cases our portable shelters won’t increase your property taxes. With or without options you get the same top quality construction with reinforced strength that will last you for years to come. 4 Seasons Shelters, the world leader in custom built, completely portable structures.